Why is it so hard to get the floor right? Is bigger always better - triple better than double? Building-Integrated Solar Technology - it's coming! It could be argued that the fire door is the most prevalent fire safety measure in any built environment. Whilst many, much more technologically advanced fire safety systems are being conceived, designed and installed, fire doors remain fundamental to most fire safety strategies for buildings. Fire doors provide protection to critical fire safety provisions within the building, such as escape routes (stairs and corridors) and places of relative safety, or in lines of compartmentation separating different fire hazards in a building. Their importance can be measured by the attention paid to them in Approved Document B, where an entire Appendix (Appendix B) is dedicated to their correct testing, specification, labelling and performance. This is in addition to the recommendations on their installation and location in a specific building that are given in the main body of the document. At first glance the fire door may appear to consist of little more than the door leaf itself. But many other elements of the “doorset” are vital to the proper functioning of a fire door. The ironmongery (handles, latches and hinges), glazing systems (glass, beading, fixings) intumescent products, door closers and doorframes are all essential elements of fire doors which must be fit for purpose and function as intended. In fact, consideration of fire door performance extends beyond the doorframe to the aperture reveal. The architrave and door frame packing material, whilst not strictly speaking part of the doorset, are key components in ensuring the overall performance of the fire door. It is only through standard fire resistance testing, or assessment, that the appropriate period of fire resistance performance can be attributed to a fire doorset. It is not just the performance of the door leaf that is considered – all of the elements listed above have crucial roles in ensuring the fire doorset performs as intended, and must be part of any assessment. The period of time for which a door can resist a fire is only as long as that of its weakest part. If, for example, a doorframe is installed in an aperture back filled with an inappropriate material, or the door leaf is fitted with untested or incorrectly tested ironmongery, the overall performance of the fire door will be compromised. impact and associated damage through general wear and tear or daily use. 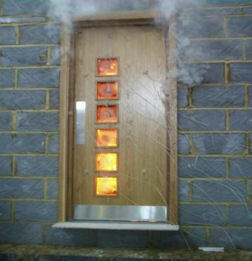 The fire door remains an intrinsic and critical component of fire safety provisions for buildings and their occupants. It is therefore essential that the performance, specification, installation and maintenance of this commonplace and apparently “humble” component is afforded the same level of importance as any other fire safety system.